Girl Child Group DHPS is visiting continously the children hostel: Learners report | Moria Grace Katutura e.V. 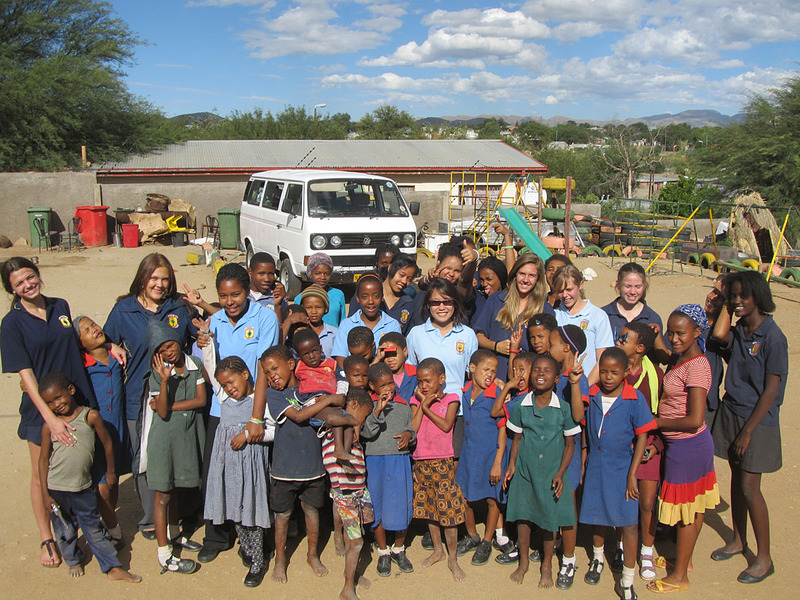 “A visit to the Mother Wilhelmina Hostel: On another beautiful sunny day we, the Girl Child Group from the DHPS in Windhoek (Deutsche Höhere Privat Schule), drive out to Katutura to visit all the children at the hostel. The moment we arrive and step out of the bus, smiling faces and loving hearts greet us. It’s always a pleasure for all of us to see each other. A soon as everyone is outside the children start singing some up-beat songs for us. Following that, we talk about the plan of action for the afternoon and then we start with it. During our last visit we brought wool to plot bracelets which a lot of the girls enjoyed, including us. We also brought paint and painted hopping games on the ground. The kids really loved that and still enjoy it. We also drew beautiful pictures on the ground until we ran out of paint. The kids also loved playing soccer so we took two footballs with us and played with the boys and a few girls as well. Later in the afternoon everyone enjoyed a piece of cake after which we unfortunately had to leave. The goodbye is filled with songs and waving and is usually very hard for all of us. Everyone, the kids from the hostel it looks like it and definitely us, the Girl Child Group from the DHPS enjoy the visits so much. It is always a fun filled day for all of us. The visits to the hostel are not only fun afternoons but visiting the hostel also reminds us about how lucky we are and that all of us should take a little time to give to those who are in need. Sometimes it only takes a little caring to put a smile on someone’s face. Thanks a lot for this great co-operation since more than two years! This entry was posted on 30/07/2013 by katharinawyss in News Moria Grace and tagged dhps social activities, girl child group dhps.